An inside look at the secretive world of elite philanthropists—and how they're quietly wielding ever more power to shape American life in ways both good and bad. While media attention focuses on famous philanthropists such as Bill Gates and Charles Koch, thousands of donors are at work below the radar promoting a wide range of causes. David Callahan charts the rise of these new power players and the ways they are converting the fortunes of a second Gilded Age into influence. He shows how this elite works behind the scenes on education, the environment, science, LGBT rights, and many other issues—with deep impact on government policy. Above all, he shows that the influence of the Givers is only just beginning, as new waves of billionaires like Mark Zuckerberg turn to philanthropy. 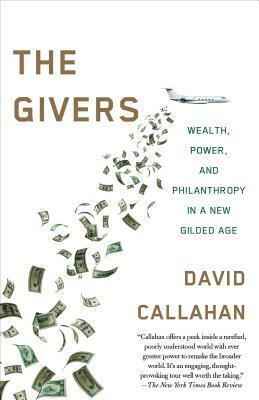 Based on extensive research and interviews with countless donors and policy experts, this is not a brief for or against the Givers, but a fascinating investigation of a power shift in American society that has implications for us all. DAVID CALLAHAN is the author of seven previous nonfiction books including The Cheating Culture: Why More Americans Are Doing Wrong to Get Ahead and Fortunes of Change: The Rise of the Liberal Rich and the Remaking America. He is founder and editor of the media site Inside Philanthropy, and co-founder of the national think tank Demos. His writing has appeared in numerous publications, including The New York Times, USA Today, the Los Angeles Times, and The Washington Post, and he is a frequent media commentator. He is a graduate of Hampshire College and holds a Ph.D. in politics from Princeton University.